You are currently browsing the tag archive for the ‘nature’ tag. Last post on the greenhouse for awhile. If it’s still there, I’ll go back in the fall and again in winter and again in spring until they tear it down. Here is the wide view, the three big greenhouses stacked side by side, maybe a football field in length. It leaves me wondering about a few things I could easily find out. Who mows the area around it? Something’s been planted in neat, organized rows along the road and I wonder about that. 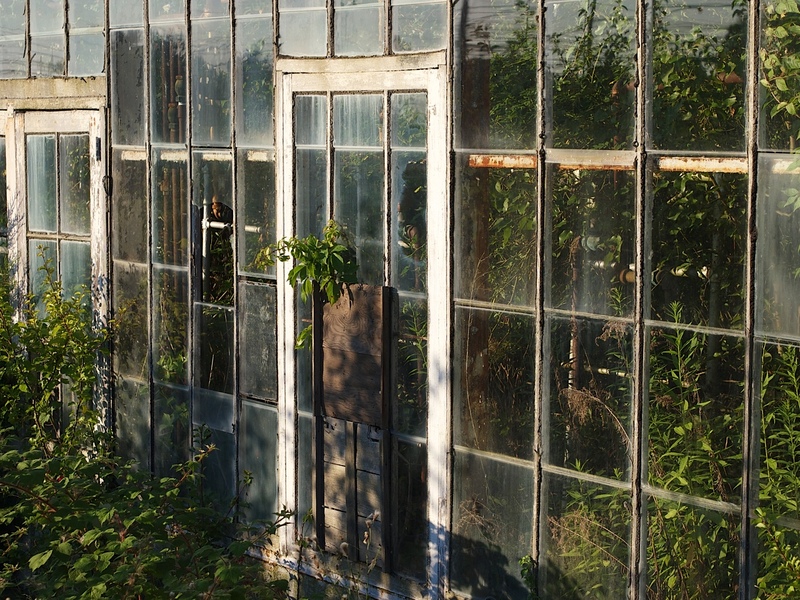 It’s neglected and tended, in disrepair but seemingly unvandalized, overrun by a collection of nature that isn’t all that natural. Why not just leave it alone and see what happens? My dad, 82, lives just a few miles from this place. I live in New York, about two hours away.When he was my age, he had a place with a boat on Great Bay in New Jersey he’d go weekends during the summer with Janet, his second wife. I’m convinced that I brought my second wife there once with the kids about a dozen years ago, just before he sold it. The boat was already gone, but the dock was still there and anyone who’s ever been there could instantly conjure the smell of the salt marshes and the light just before sunset. I’m the only one with that memory and I can’t say with any certainty that it happened. 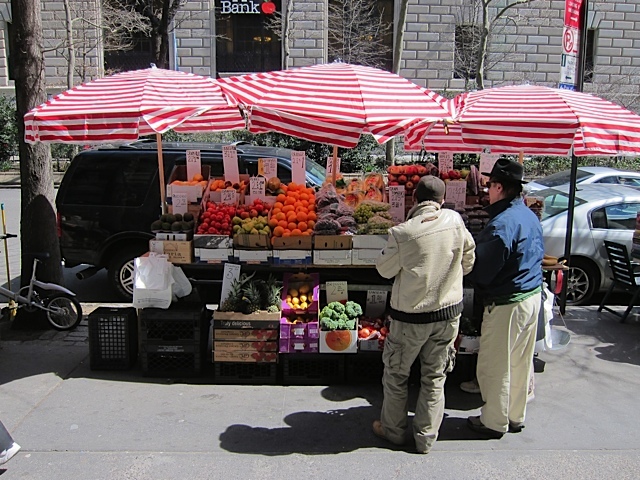 Spring has signaled return of the fruit stands, little islands of spherically-contained naturally sugary fruitplosions and fruitruptions all nurtured to fruition by a little bit of warm weather. 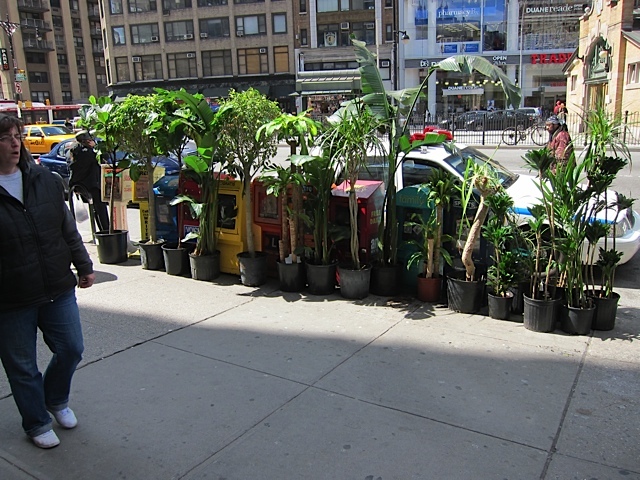 …and horning in on the action, a few pathetic inedible houseplants, clad only in their limited shades of green. This blog isn’t about anything as serious as climate change or decimation of species diversity. And frankly, we don’t acknowledge the existence of anything as anything but the pure fabrication and continued hyperbole of the elitist media. Stop elitist media now! More newspapers, less stuff that I disagree with! There, Closed for Business has stated a position. The path leading to Mendenhall Glacier has occasional markers of its former edge, like the one pictured below. Our guide suggests that within our lifetimes Mendenhall will close for business, simply melting and receding into the distance. A bald eagle, Mendenhall Glacier. Moss on a roof, Juneau, AK. Plywood in use in Juneau, AK. Ship and wheelbarrow in the mist, Auke Bay, AK. The first two photos should be one long panorama, but I couldn’t get them to stitch together properly. 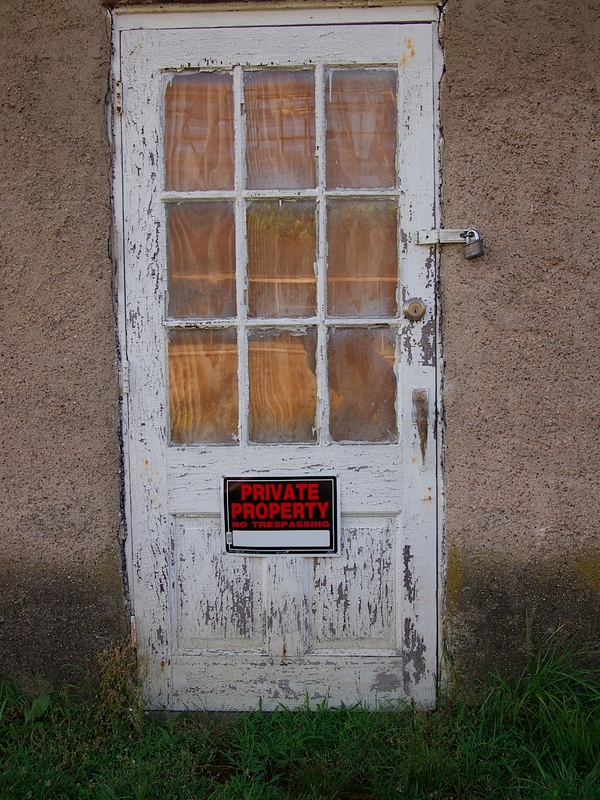 In the first shot, one of the doorways is crooked – there wasn’t an earthquake, I just lined things up crookedly. This DVD store is NOT closed. It just looks that way. NOT Closed. Still Open. You can buy DVDs there. I think you can sell them or rent them too. Not closed. Open. Finally, this image, a panorama of a section of the garden at St. Luke’s of the Fields on Hudson Ave. I know – it’s too long and narrow to really see any detail from this photo. If you’re in the neighborhood and like trees, flowers, birds, and butterflies, pop in for a visit. There are some fantastic and uncommon or NYC trees there, like a Dawn Redwood and what I think is a Crape Myrtle. Urban street fruit is faring very well these days. 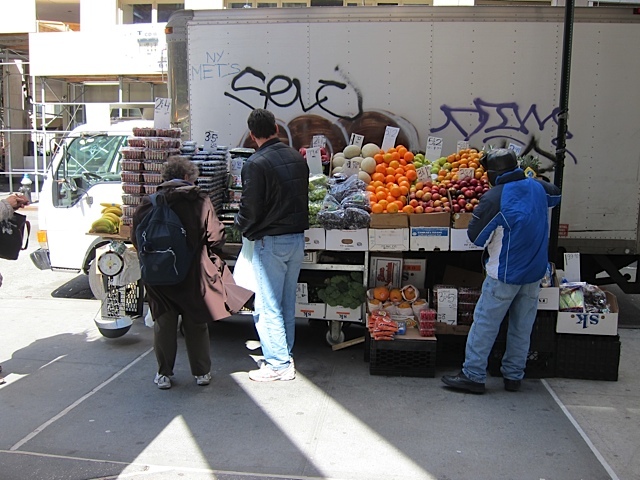 In most Manhattan neighborhoods, you don’t have to walk more than a few blocks before finding fruit you can acquire without having to enter a store. Fruit has many uses: it’s edible, you can decorate a hat with it, and when made airborne, is a thoughtful way to express your opinion of live theater. This last one isn’t technically fruit. Those of you over the age of 35 might recognize these as vegetables, a less than popular subset of fruit. 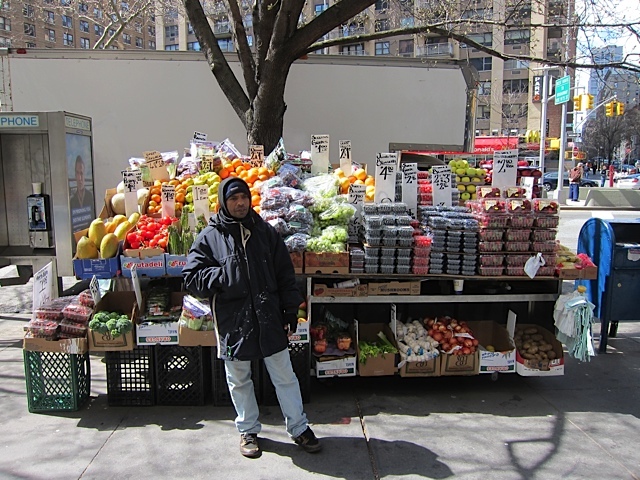 Do vegetables get short shrift in the city? 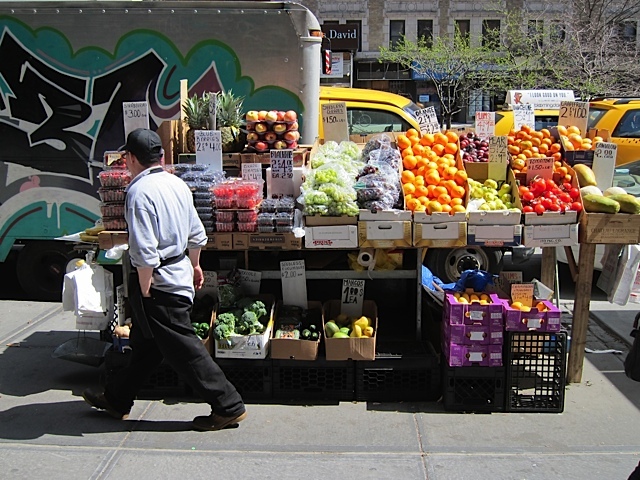 Wouldn’t a broccoli and cabbage stand strategically located in Times Square help initiate veggie-phobics to the pleasures of cruciferous plants? Why isn’t a city agency addressing these questions? I took these photos from the comfort of an Amtrak train to Philadelphia and back the other day. North Philadelphia used to be a bustling manufacturing area, packed with factories, warehouses and rowhomes. 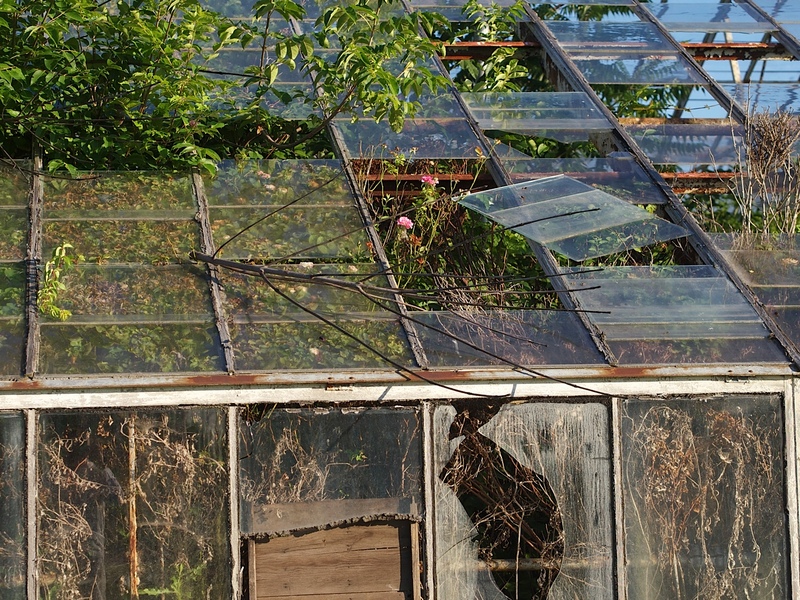 As manufacturing fled the northeast over the last sixty years, these buildings were left behind. A couple things about this next picture. It’s conveniently located behind the SEPTA North Philadelphia station. You can see vines encroaching on the right side of the building. It’s huge. Blurry, I know, but I didn’t have the good camera with me. In Riverside Park just north of the Boat Basin, a pair of red-tailed hawks have made a nest in a London planetree. I chatted with a woman who told me that this is the same pair who had built a nest last spring and hatched several chicks. Unfortunately, the nest fell from the tree before the chicks could fly, killing the chicks. There are three chicks this year, although I saw just two plus the adults plus dinner. is turning its prey to prepare to eat it. Meanwhile, the squirrel in the foreground flees. A chick waits or its dinner.